A series of rainstorms passed through California earlier this month, dropping incredible amounts of precipitation onto our parched state. The rain was enough to ease drought conditions in several parts of the state, noticeably increase reservoir levels in some of the state’s largest, more northern reservoirs, and cause flash floods, mud slides, power outages, and road closures. Check out the “Drought Status” below to see other ways the recent storms have impacted the drought and how far we still have to go. 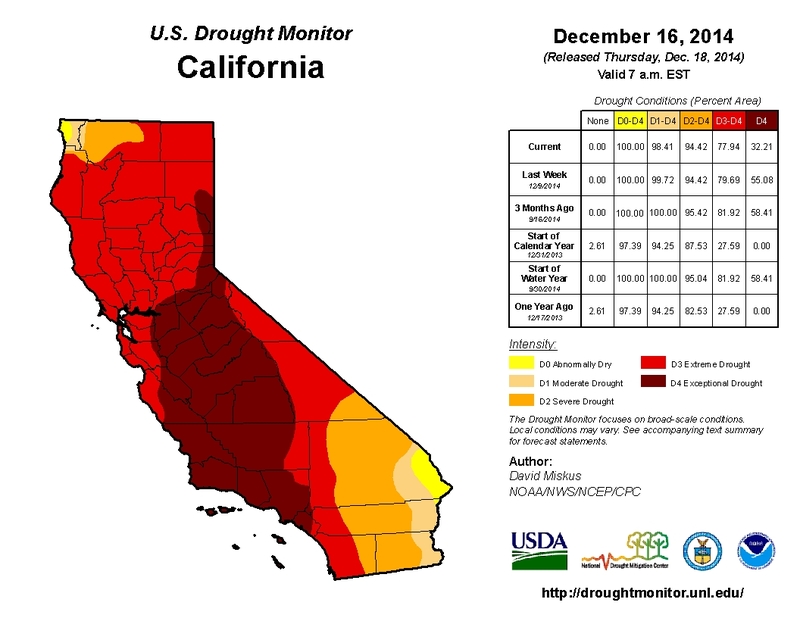 Two weeks ago, the House of Representatives voted to approve HR 5781, the California Emergency Drought Relief Act of 2014. Although Congress has already left for winter break, the bill could be taken up again by the new Congress in 2015. UCLA scientists published a report on the impact of climate change to the Los Angeles region. The research suggests that, while flooding can be expected to increase as more precipitation falls in the form of rain rather than snow, the average amount of precipitation is not expected to change much in the coming decades. Last week, NASA scientists presented findings that show it would take 11 trillion gallons of water for California to recover from the drought. The San Francisco Public Utilities Commission signed a $113 million agreement with San Bruno, Daly City, and the California Water Service Company, where, during wet years, the Commission will sell excess Hetch Hetchy water so these areas on the Peninsula can fill up their groundwater reservoirs. Drought conditions have improved from last week; most notably, 32% of the state is now in “exceptional drought”, down from 55% last week. 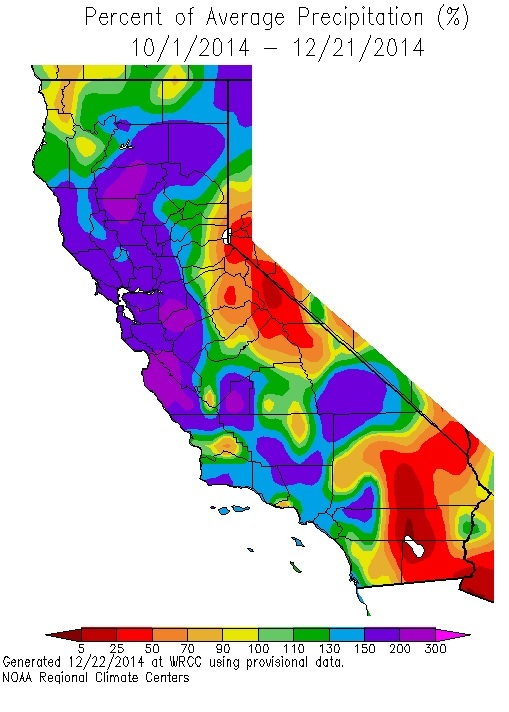 Large areas of California have received more precipitation than usual for this time in the water year. 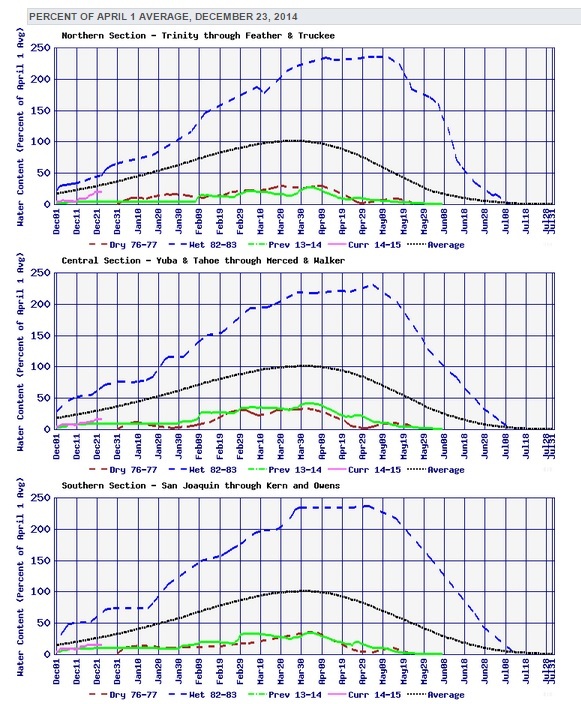 While the snow water content isn’t above the historical average for this time of year, it is above the levels seen this time last year. 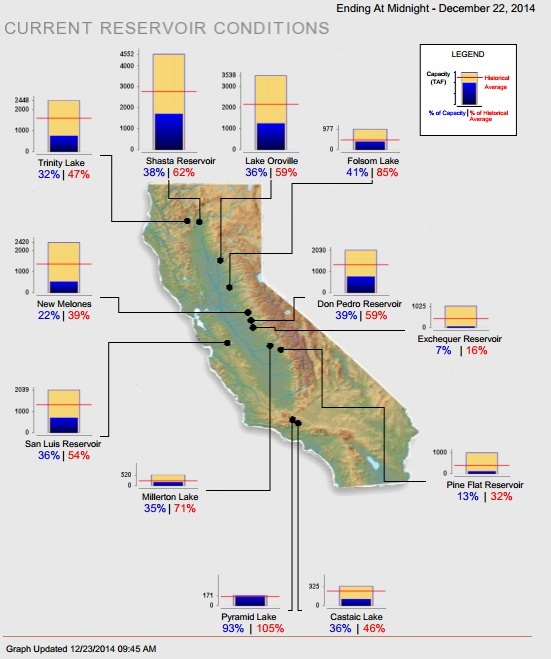 Statewide, California’s major reservoirs (representing 27.3 acre-feet of storage) are at 33% of capacity and 57% of normal. 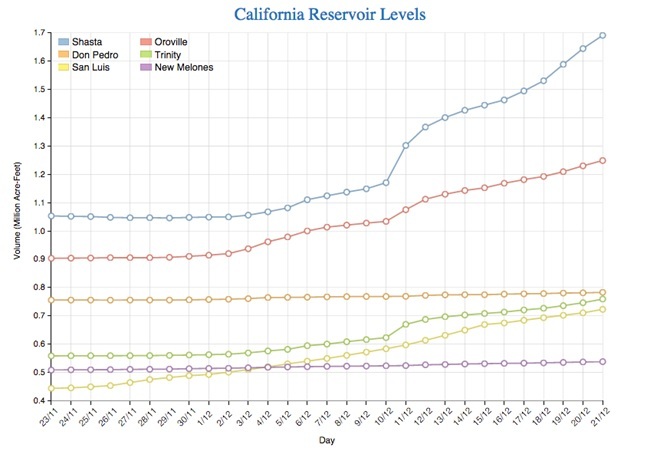 Five of the state’s six largest reservoirs (Shasta, Oroville, Trinity Lake, San Luis, and Don Pedro) are all now above 32% capacity. New Melones is at 22% capacity.